What kind of a person makes lewd comments to the Easter Bunny? Cops say the 54-year-old Ohioan spent Saturday afternoon at a carousel park in Richland, a city midway between Columbus and Cleveland. Hughett “appeared intoxicated,” according to a witness who spoke with police. At one point, Hughett, seen at right, had her photo taken with the Easter Bunny. It was then that she “allegedly made lewd comments to the Bunny” before hopping on the carousel. Sadly, a Mansfield Police Department report does not further describe the inappropriate words reportedly whispered in the victim’s giant ears. Video shows Hughett perched on the Easter Bunny's lap with her right hand on the character's crotch. Watching this, a female onlooker can be heard saying, "Oh my! This is a kids event." A still from the video can be seen below. When officers confronted Hughett, she displayed various signs of intoxication, like slurred speech, bloodshot eyes, and a generally wobbly demeanor. 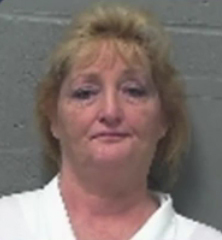 She was arrested for public drunkenness and booked into the county jail. Hughett, who was convicted last year of aggravated assault, is not facing charges for her inappropriate comments to the Easter Bunny.